When you are supposed to use your document in a non – member (not a member of Hague convention) country it is mandatory that you complete the legalization process. Attestation On Time(www.attestationontime.com) can guide you the attestation/legalization process. Countries which requires Embassy Attestation? UAE,Qatar,Kuwait,Saudi,Bangladesh,Angola,Cameroon,China,Cuba,Egypt,Iran,Iraq,Lebanon,Libya,Malaysia,,Nepal,Pakistan,Phillippines,Syria,Sri Lanka,Singapore,Uganda and some more to be added. You may reach our documents clearance department who can give you more information about embassy attestation by calling +971555514789. When you get an opportunity to use your documents in any of the above countries ensure that you have your documents legalized before you submit your documents. Before you give your documents to legalization kindly check with the authorities to ensure if legalization or Apostille needs to be done on your documents. Who can help you in Attestation? 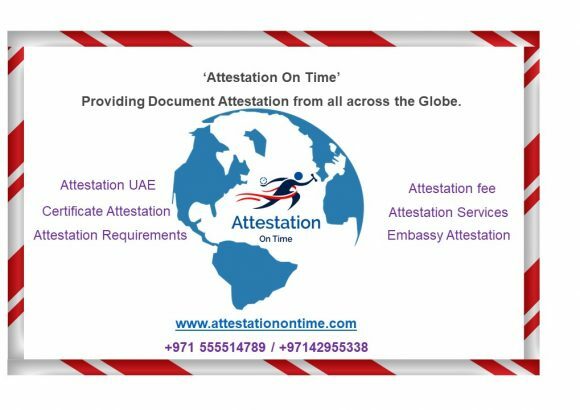 Attestation On Time(www.attestationontime.com) one of the leading documents clearance company can help you in getting the process completed without your process. All you need to do is call them at +971555514789 / +97142955338 clear your queries and then hand over your documents. Experienced and talented staffs can guide you the process related to attestation and ensure complete legalization process is completed.